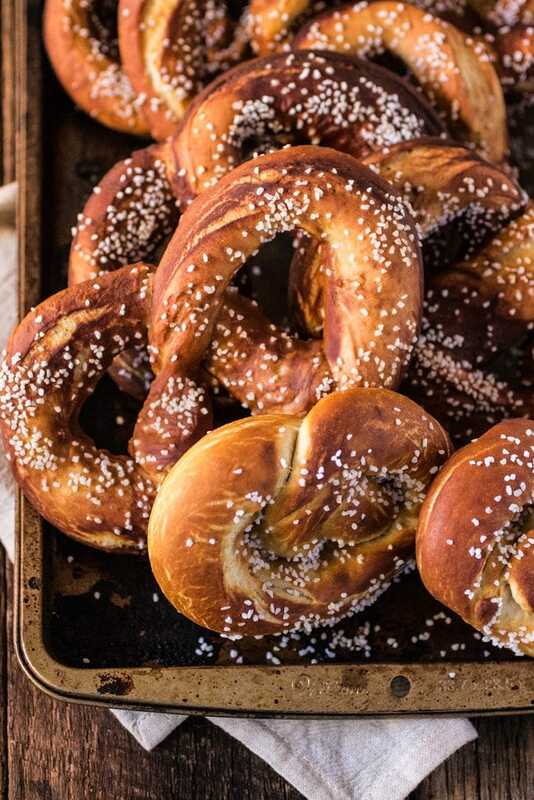 Oktoberfest is here, which means that we need a really yummy soft pretzel recipe to go with all the beer we are planning on drinking, right? If that applies to you, you’re lucky, my friend! 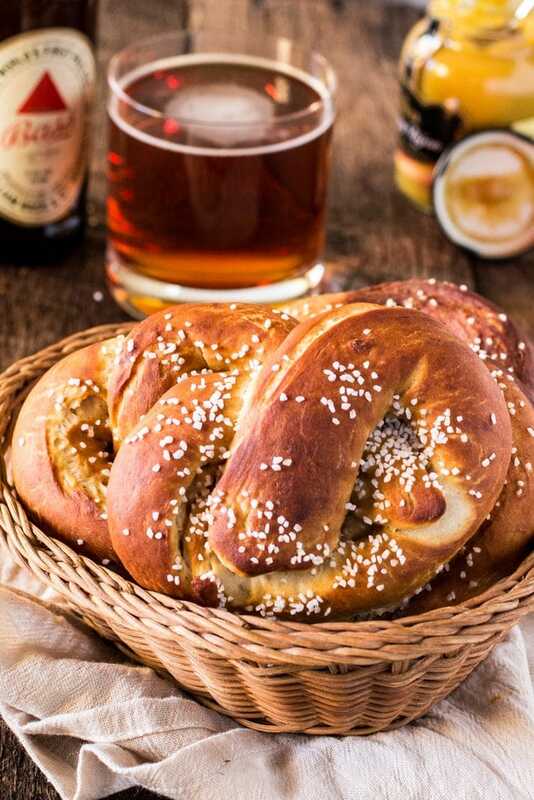 Because these German Soft Pretzels, or Laugenbrezel (if you wanna sound fancy and impress your friends), are so delicious that you might even forget to drink the beer. Who would do that? ?❤️? More than 6 million people from all over the world attend the festival, which usually happens from mid September to the first weekend in October. The first Oktoberfest took place from Oct 12-17 in 1810 to celebrate the marriage of Bavarian Crown Prince Ludwig to Princess Therese von Sachsen-Hildburghausen. The five day celebration toasted the royal couple and ended with a horse race in the town square. Since that first celebration, festivities were held every year to commemorate the royal marriage. By 1896, the first beer tents were erected, featuring beverages from local Munich breweries to celebrate the regional drink. Nowadays, several other cities across the world also hold Oktoberfest celebrations, modeled after the original event. I mean, because who doesn’t wanna drink a ton of beer and eat delicious German food? These dark brown, crispy (yet soft inside), salty little guys are the perfect sidekick for an ice cold beer! Add a side of honey mustard or butter and I’m in heaven. As you’ll notice in the recipe below, I chose to not do the Natronlauge because of safety. Honestly, I even ordered the stuff from Amazon, but ended up calling them to cancel because not only I am VERY accident prone, I couldn’t possibly sleep peacefully knowing that I posted something on my blog that could get someone hurt. But do not fret! A baking soda solution is a fine substitute and you won’t risk hurting yourself. Yes, please! Do not skip it! 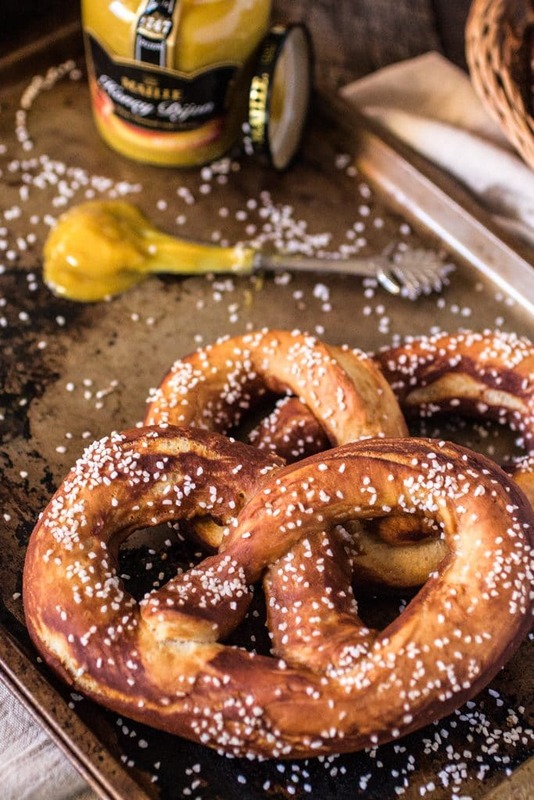 That step only takes a few minutes and it’s what makes these pretzels out of this world good! 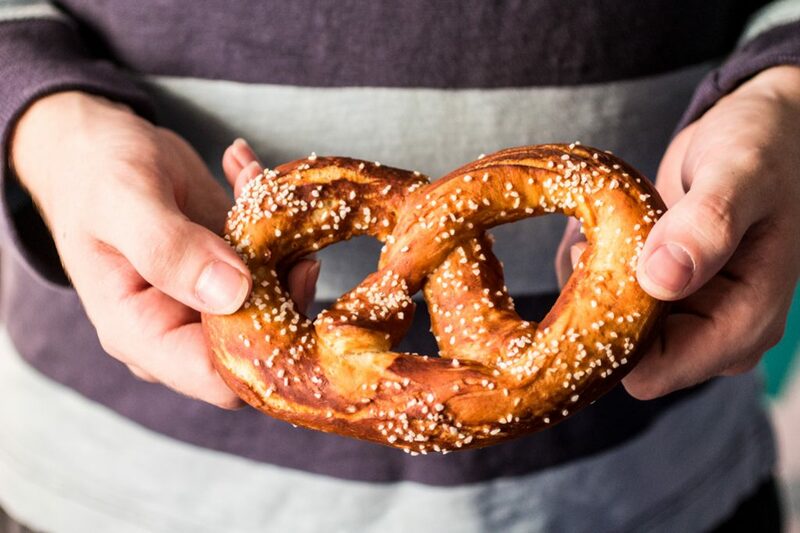 The alkali solution made with baking soda and water (plus beer and brown sugar for extra flavor), is what causes the pretzel to “puff” and get all soft and nice inside. It also gives them their distinctive flavor and dark brown color. If you skip this part, your pretzel will have a different flavor and texture. Quite frankly, it won’t be a pretzel! Also, do try to use the Barley malt syrup because it adds this amazing subtle yet complex flavor that is so characteristic to pretzels! (If you cannot get your hands on one, substitute for brown sugar). As for the Pretzel salt, you can find it on Amazon. Or you can just substitute it for kosher salt! Serve warm with honey mustard, plain mustard or butter! Don't forget a glass of ice cold beer! Disclosure: This post contains affiliate links. I will receive a small compensation if you purchase anything through my links. I only promote items that my family or I have used personally and have enjoyed. these look delicious Olivia! I don’t drink alcohol but I would be more than happy to eat these pretzels! yum! WOW! We are going to Summer, here in Brazil, but it’s a perfect apetizer with a regular beer too! 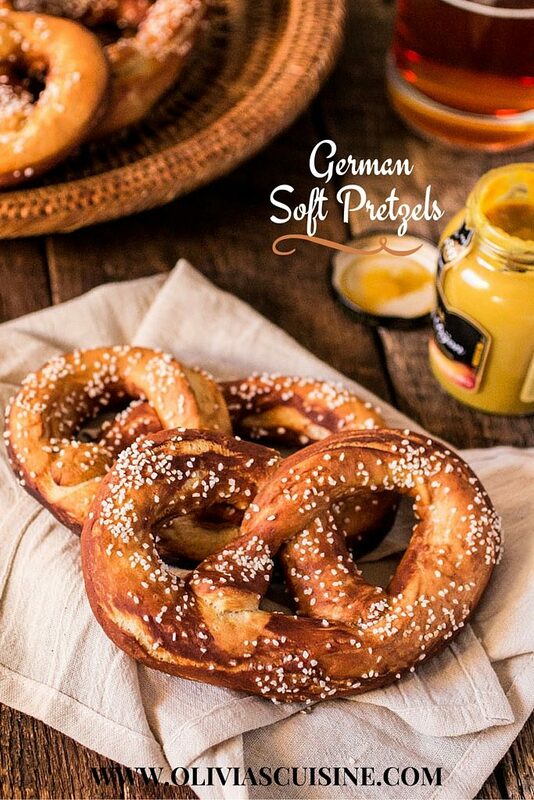 Your pretzels look so delicious…I am ready for Oktoberfest! I could go for one of these and a beer right now! As you know you are featured tonight on #FoodieFriDIY (fun chatting on twitter earlier!) …I sent tons of foodie love your way! Looks tasty although it’s funny that this doesn’t have draino in it like autentic German recipes. Also, i have no idea where one gets barley malt syrup or even what it is. Is there a substitute? Looks good. What is Barley Malt Syrup and can I make this without that? These will come out much better if you use the traditional Lye to dip them in. I personally don’t use rubber gloves but I am very carreful and don’t let others in the kitchen when I am making them.